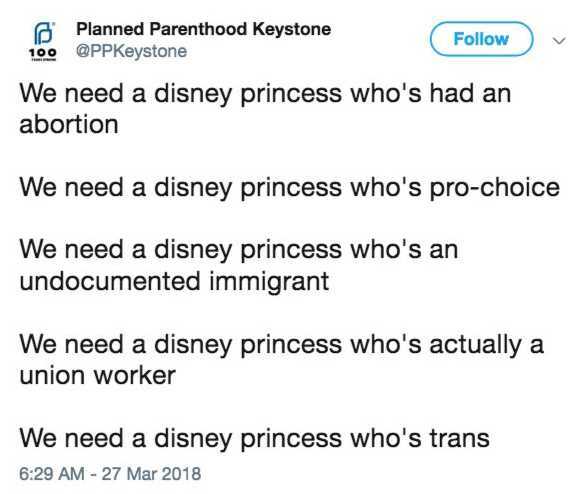 ALLENTOWN, Pa. — A Pennsylvania chapter of Planned Parenthood tweeted on Tuesday that Disney should create a storyline about a princess who has had an abortion, or has gender dysphoria, or is an illegal immigrant. The entity later deleted the tweet following public outrage. “Today, we joined an ongoing Twitter conversation about the kinds of princesses people want to see in an attempt to make a point about the importance of telling stories that challenge stigma and championing stories that too often don’t get told,” Planned Parenthood Keystone President Melissa Reed outlined in a statement. However, Reed said that “upon reflection,” the Allentown-based group decided that the “seriousness” of their point wasn’t appropriate for the subject matter of what Disney princesses people would like to see, and consequently deleted the tweet. The tweet still may be viewed via the Wayback Machine, and members of the public continue to express disgust. “Leave your agenda out of children’s movies/entertainment,” one commented. “That’s their goal: indoctrinate children as young as possible,” another opined. “We need a Planned Parenthood who’s not funded by taxpayers,” a third wrote. Planned Parenthood of Indiana and Kentucky recently also raised eyebrows after tweeting “Some men have a uterus,” writing the statement 11 times. That post still remains on the affiliate’s Twitter. As previously reported, according to its annual report, Planned Parenthood performed 321,384 abortions during the 2016-2017 fiscal year. The CDC, which releases nationwide abortion figures each year, outlined in December that “women in their 20’s accounted for the majority of abortions and had the highest abortion rates,” noting that the vast majority—85%—of women obtaining abortions are unmarried. Most abortions are for convenience purposes. 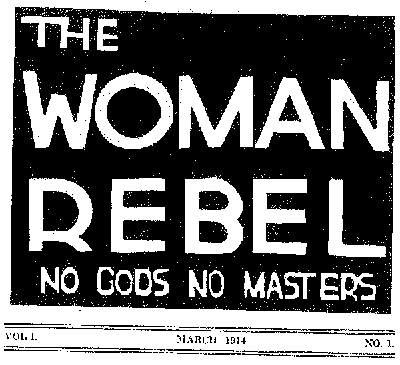 “The great majority of women, however, belong to the working class. Nearly all of these women will fall into one of two general groups—the ones who are having children against their wills, and those who, to escape this evil, find refuge in abortion. Being given their choice by society—to continue to be overburdened mothers or to submit to a humiliating, repulsive, painful and too often gravely dangerous operation, those women in whom the feminine urge to freedom is strongest choose the abortionist,” she wrote. However, Sanger’s solution to countering abortion was birth control, initially naming her organization the American Birth Control League. She decried large families, writing in a chapter of her book “Woman and the New Race”, “The most serious evil of our times is that of encouraging the bringing into the world of large families. The most immoral practice of the day is breeding too many children.” She claimed that children get lost in large families and end up in jail or as prostitutes. Sanger was also an advocate of eugenics against the disabled, as she made a correlation between birth control and the purification of the races.